As technology impacts our workplace and daily lives, employers face a rapidly evolving landscape. IT solutions are no longer plug-and-play. Now, more than ever, talent is the key to an organization’s success. They require skilled resources to reach their full potential. Want an accessible version of the 2018 Talent Brief? Click the button below to download the PDF and take it with you on the go. A digital uprising, considered a fourth industrial revolution, is rapidly becoming a workplace truth. Technology enables us to stay connected, transmit and receive real-time responses, expand our realities and make informed decisions faster than ever. At the same time, organizations are adjusting to take the lead with contract or contingent workers— in part to address the challenges of a talent shortage but also in response to the changes around what people want out of their career. New trends are reshaping the workplace, causing companies to acknowledge the changing profile of employees and shifting expectations of the work experience. Despite an always uncertain future, outlooks are largely optimistic. Job seekers with cutting-edge skills are scarce, creating a new intensity in the war for talent. 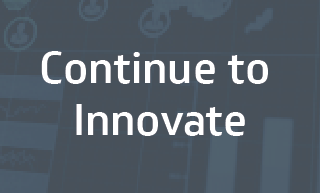 Companies must continually innovate to remain competitive. Job seeker criteria and expectations are changing as each generation develops different desires. Employers are increasingly competitive in response to overwhelming demand. 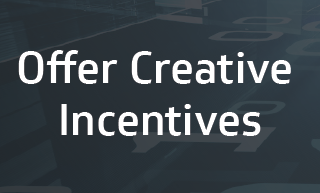 Creative incentives are becoming the standard to attract and retain top employees. The disparity between supply and demand of candidates exacerbates the race for talent. Despite positive predictions, the challenge of securing scarce talent is keeping executives awake at night. Almost 90% of C-suites expect an increase in competition for talent this year, and over 30% of the same C-level respondents expect significant competition, Mercer reports. The disproportion between supply and demand touches all industries and geographies, stressing operational functions. It is forecasted to become expressly acute in leadership, core operations, sales, marketing—and we see a significant impact in IT. Refer to the Tech Market Drivers section for more information on these six technologies. 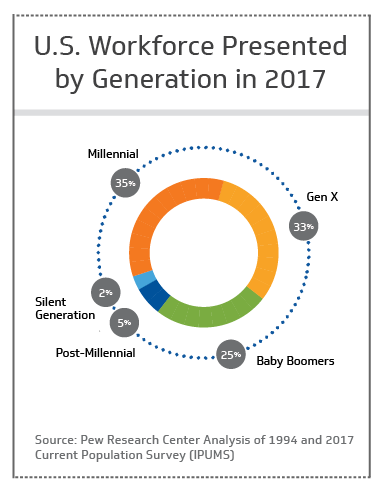 As of 2017, millennial employees, who lead the current workplace transformation, make up the largest percentage of the U.S. workforce, followed by Generation X and baby boomers. 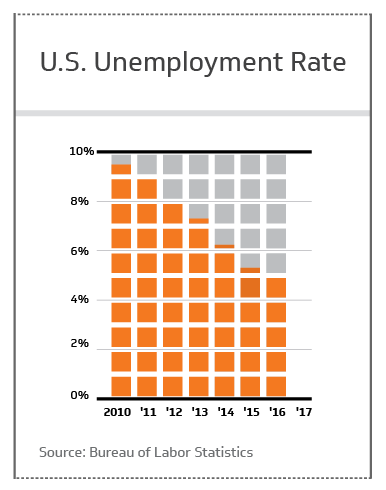 The U.S. unemployment rate has steadily decreased since 2010, indicating that we are currently in a period of development and production increases while experiencing a corresponding demand for labor. The national need for STEM-educated professionals creates high demand, yet a significant population of STEM-focused graduates resides outside of the U.S. Historically, the U.S. dominated this area, supplying most of the world's graduate populace. However, in recent years, that group has shifted due to steady academic progress in Asia. At the turn of the century, China began pushing third-level education. At its peak, Statista reports that China was building a new learning institution every week. By 2016, it surpassed both Europe and the U.S. in graduate numbers. The U.S. recently slipped to third place, behind China and India. This trend continues as the number of Chinese graduates ages 25-34 is expected to increase 300% by 2030, compared to 30% in the U.S. and Europe, according to The World Economic Forum (WEF). 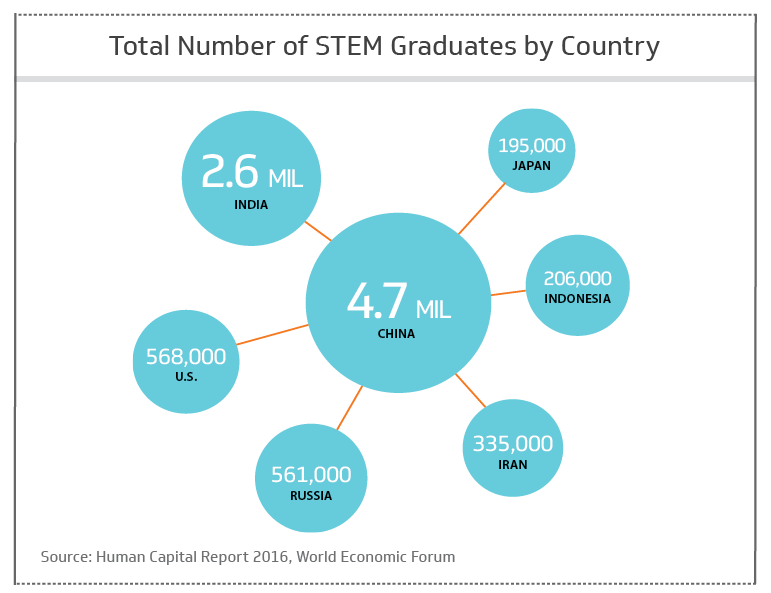 Graduates with STEM qualifications are ever more vital to maintain and expand global prosperity—and China and India are now leading sources. How is the U.S. leveraging foreign-born workers in STEM? Mohan: First, about 25% of the U.S. STEM employees are made up of foreign workers. For high-tech workers, that number is between 30% and 40% depending on the skills and location. These workers get here on a highly-specialized visa known as the H-1B or through the student work visa program. Then, 70% of graduates completing their doctorates in the U.S. are foreign-born. Once these students graduate from U.S. schools, they’re authorized to work here for a set period of time. They help with research and supplement our domestic workforce in many U.S. companies. It's a collaborative process where one supports the other—and it's a highly-beneficial relationship. Also, almost 50% of the world’s migrant population works in the U.S. This is why U.S. immigration processes are so complex and constantly evolving. Despite the visa complexities and numerical shortages, the U.S. is truly the land of opportunity for STEM workers. Why are foreign-born workers so crucial to the U.S. economy? Mohan: The STEM talent gap in the U.S. is significant, and more and more U.S. companies are leveraging foreign-born workers to fill this gap. The technology employment rate is almost at 100%. Emerging skills, such as those that support development of artificial intelligence, are so in demand that their availability is into the negative numbers territory. The U.S. is ranked number one in high-tech innovation—as per Bloomberg’s 2018 Innovation rankings—confirming that firms need foreign-born workers to stay consistently competitive. And with the demand for talent rising, this need is exacerbated. Purpose, flexibility, engagement and advancement opportunity are increasingly important to today’s job seekers. Although 89% of employees are at least somewhat satisfied with their jobs, 40% considered the possibility of seeking employment elsewhere in the next 12 months, according to a 2017 SHRM employee benefits report. An attractive and competitive benefits package is the go-to solution to improve recruitment and talent retention. 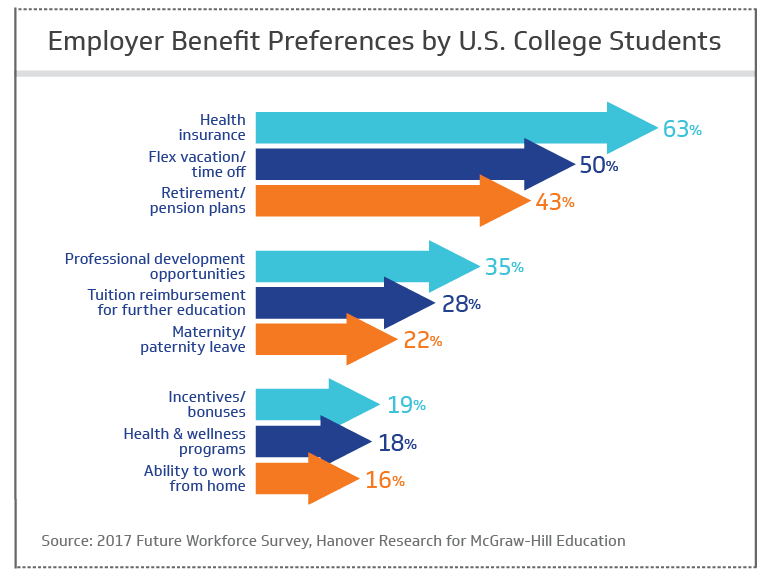 In 2017, 16% of organizations augmented health and wellness care with professional and career development benefits, and 14% implemented more flexible work options. Professionals now expect their employer to “make work work” for their individual circumstances. Organizations are responding by taking a “whole person” methodology, allowing technology to enable individualized choice without adding an undue burden on HR, while increasing options available to their workforce. Embracing the “whole person” agenda requires attention to all aspects of employees’ lives: their physical, social, financial, professional and psychological well-being. A plan demonstrating care for employee health is good business and also acts as a significant attraction and retention strategy. What are job seekers looking for in a prospective employer or job opportunity today? Zaller: From what I’ve seen, it’s less about convenience and more about the opportunity. More so, it’s what the employer is doing to make an impact. It’s the technologies they’re working with and the goal or product that company is pushing. Job seekers are also interested in the problems that these technologies solve. Now, when you’re looking at the tech landscape, it goes beyond just having someone sitting in a chair writing code. Today, tech talent has the opportunity to solve major problems and put products in front of customers that don’t yet exist. Five years ago, when we were hiring for some of the same skill sets, we didn’t have that story. What elements of the employee experience are important to job seekers? Zaller: Number one is definitely autonomy in the work environment, their ability to flex their creative muscles. They want to have creative freedom in finding solutions, and that’s something we haven't always seen in the contracting world. It’s becoming an increasingly important motivator to them. Then comes flexibility, the option to work remote and access to bleeding edge technologies they wouldn’t get in their current environment. What can set a company apart from others in the eyes of a job seeker? Zaller: Focus on the products they’re working on and the problems they are solving, include transparency around their priorities and initiatives and show the job seeker how the technology is influencing the world. We’ve provided candidates to help solve traffic pattern problems in the country’s most congested cities through autonomous vehicles and work on integrating health features in some of the most highly-downloaded sports and retail apps. These platforms potentially touch millions of users a day—that’s huge, and those are just two examples. After that, it’s what we’ve already discussed: flexibility, work environment and culture—these are all game changers. The rapid rise of smart machines and the increased complexity of organizations are just two ways that today’s workplace has transformed over the past 30 years. What it means to be an employee—and the value of an employee to an enterprise—has necessarily been adjusted. It’s no longer only about output. In fact, 97% of employees want to be recognized and rewarded for a wide range of contributions, not just financial results or activity metrics. Only 51% say their company does this well today. Management of rewards and recognition reflect an organization’s culture and can send powerful signals about what is valued. 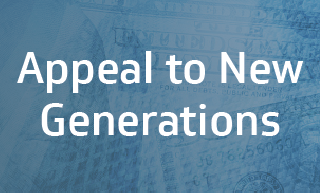 Beyond compensation, there are several benefits organizations may offer to attract talent transitioning into the workforce. Millennials are reinventing the workforce. Flexibility and advancement are among some of the most important factors to millennials when choosing a job. People leave their jobs for a variety of reasons, from the desire to seek career advancement or greater pay, to a shorter commute or a change of careers; unfair treatment is the single largest driver of turnover. This trend touches all groups and most acutely affects underrepresented professionals. There is a high cost to low culture. Unfairness-based turnover in technology is a $16 billion a year problem. Unfair treatment and work environment are leading reasons why employees are leaving the tech industry. Overall, 60% of American employees feel “very” or “somewhat confident” about having enough money to retire comfortably, the Employee Benefit Research Institute reports. Out of the 60%, only 18% feel very confident. The number of employees reporting in these categories has declined. Another 30% of employees say they worry about their personal finances while at work. Over 50% of these employees are confident that they would be more engaged if their financial future was assured. About half of American employees say retirement planning (53%), financial planning (49%) and health care (47%) programs are critical to raise their efficiency. In this talent-based economy, the employee experience is more critical than ever when attracting the best and brightest. Getting it right is even more challenging in a workplace that must embrace multiple generations with diverse expectations. With these extreme expectations, each interaction that a candidate has during the recruitment process is a vital opportunity to shape the experience. Additionally, this new environment also requires fresh styles of leadership, new team rules and updated thinking on how to develop and inspire. C-suite executives report the top three digital related challenges most likely to have a significant impact over the next couple of years are: lack of critical skills, increasing demand for employee experience and automation at work (robotics and AI). Only 52% of employees say they have access to state-of-the-art digital platforms to support their training and development, although a majority say it is important. How do you see companies evolving to meet candidate wants and needs? Merein: I think we’ve seen a huge increase in flexibility regarding certain things like unlimited PTO, remote options and flexible start/ends times. 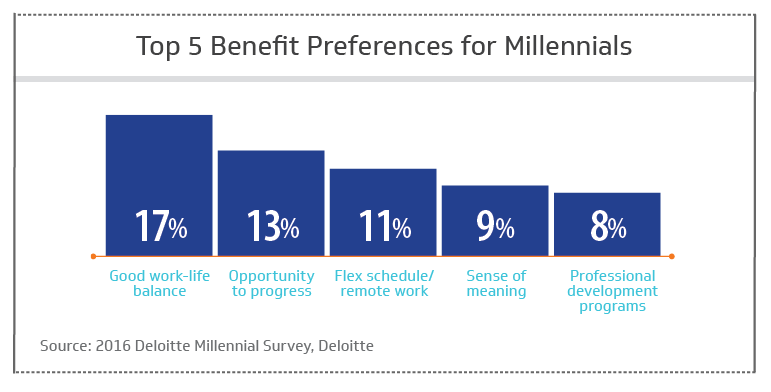 Also, we’re starting to see things like meaningful work as a big category right now for the millennial generation. To me, meaningful work is working on leading-edge technology or helping change the way the business conducts itself. For instance, in technology right now, companies are purchasing tools and allowing developers and analysts to pick from a toolkit versus prescribing only the use of Tableau or QlikView, etc. They’re letting professionals select their own medium. The last piece is a trend in hackathons and companies saying, ‘you know what, one day a month or one day a quarter, you get paid to work at the office on any project that you want.’ They’re letting employees generate ideas and solutions, which can be implemented into their business. This results in huge gains and strides from people that weren’t experts in their space, yet they’re coming up with great ideas. They’re saving companies money and providing efficiencies. What can set a company apart from others? Merein: I think more companies are allowing autonomy to enable change for the better, which is so impactful. ‘Hey, you’re getting paid for eight hours. Clear your calendar and work only on something you’re passionate about.’ Giving creative freedom in their work is impactful, cool and unique. Close to one-quarter of organizations have already upgraded overall benefit offerings in the last 12 months; health (22%) and wellness (24%) are core targets. Organizations employing younger generations must offer professional development and career advancement opportunities since they are imperative to retain millennials. Employer-sponsored health and wellness benefits are now elevated by an evolving health care industry due to requirements of the Affordable Care Act and rising health care costs. How are companies attracting top talent? Lynch: Companies are looking at different benefits to determine what they need to add to their environment. I see things like unlimited PTO, relaxed dress code and flexible schedules. This trend started in Silicon Valley with innovative companies like Google, Facebook and Netflix. Now organizations are examining what they can do to enhance employee experience. What does working at “Company X” really mean to someone? It’s becoming a differentiator. That considered, these are some of the toughest things companies face today. So there, at the intersection of business operations, technology and how companies are leveraging solutions, is where people want to work—on the cool and cutting-edge projects. How are companies retaining talent? Lynch: Culture is becoming more of a differentiator than it was in the past. Companies are taking a hard look at why people join or leave an organization, and what they can do to drive talent retention. Culture is a big part of that. If you compare benefits provided, that’s a start. But the value the company brings—what the company does for the greater good—is becoming a critical factor. Companies are paying more attention to their impact on the world; it becomes part of their branding. If your company can’t describe what it does for the greater good, you’ll have trouble attracting and retaining people. Companies are also creating atmospheres that support taking risks as part of their culture. They are ensuring their employees are fulfilled both inside and out of work. 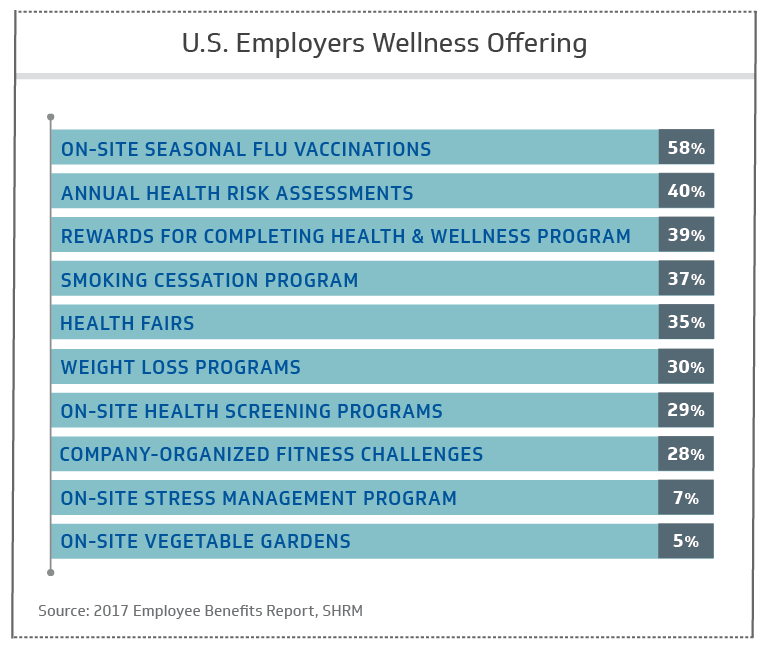 Organizations are offering their employees access to various wellness programs as an incentive to attract and retain talent. The objectives of organizational recognition programs include honoring career milestones and high performance, as well as supporting a company’s mission and values. 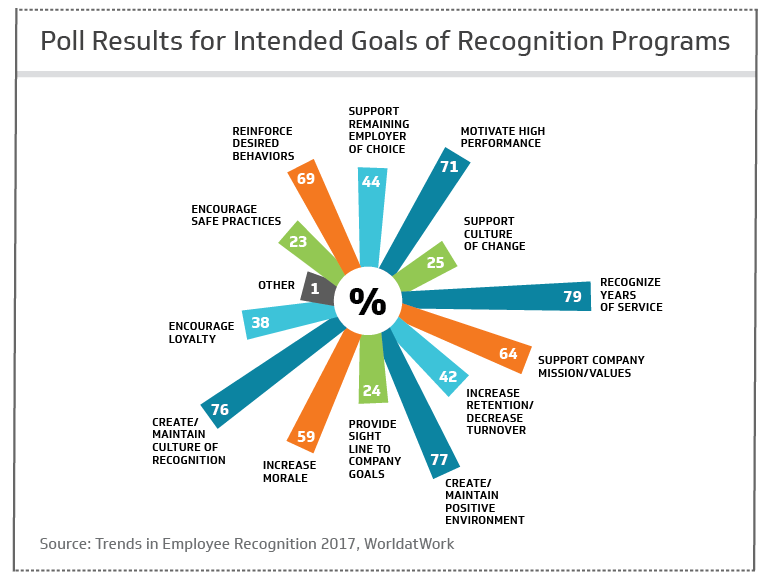 These programs are essential to bolstering employee morale and setting a standard for desired behavior in the workplace, according to a 2017 WorldatWork study on trends in employee recognition. Companies are offering educational benefits as a method to attract and retain their employees. 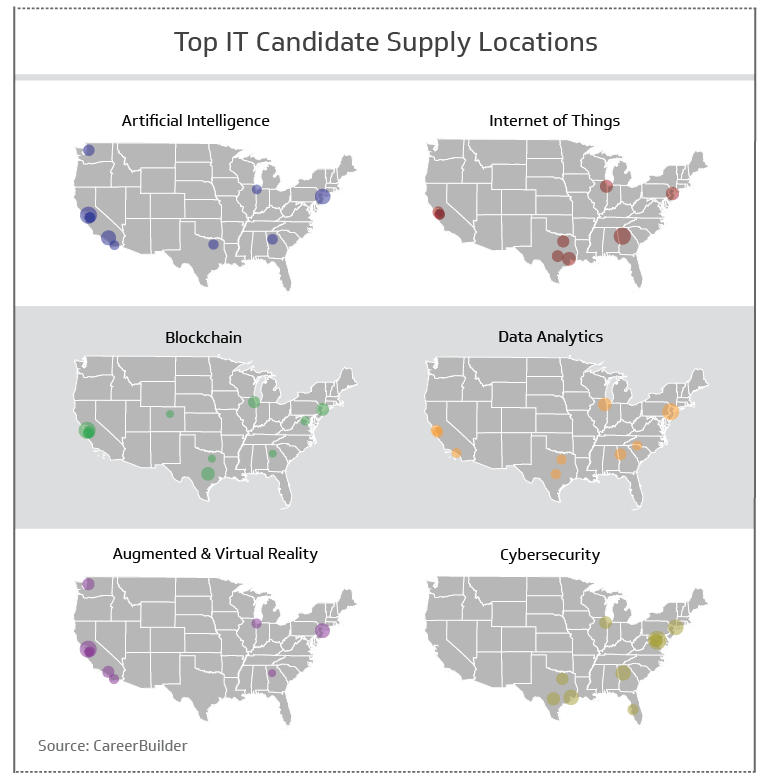 Job growth continues to increase in many fields within IT as the technology sector thrives and emerging technologies are creating an abundance of new business and career opportunities. The key technology market drivers for business and talent are artificial intelligence, Internet of Things, blockchain, data analytics, augmented reality (AR) and virtual reality (VR) and cybersecurity. These key market drivers will affect the landscape of technology needs in 2018 and beyond. AI models are based on the ways people use their innate intelligence and trial-and-error to learn gradually. Naturally, it functions quite differently. For more than a century, first impressions of AI were inspired by science fiction and computer science exploration. Recent increases in data storage and the availability of algorithms, as well as improvements in data analyses have brought AI to reality. Thinking machines are now in the process of being actively positioned at scale across almost every industry. AI already outperforms humans in a range of specified work activities, including tasks requiring cognitive aptitude. The technology’s potential, with learning as its core activity, increases with its rising adoption, per Statista. Machine learning is an analytics specialization that explores designing new learning algorithms and improving existing ones to enable computers that act and make decisions without explicit programming. Machine learning algorithms let computers analyze large volumes of data to recognize patterns and make predictions. The different types of machine learning models include supervised, unsupervised and reinforcement learning. Fully learned models are developed by running language-based algorithms, which enable the machine to learn syntax, semantics and complex world knowledge. Useful AI applications are gaining credibility and adoption in schools, homes and hospitals. Major research universities devote departments to AI studies and technology, working alongside leading companies like Apple, Facebook, Google, IBM and Microsoft. Small open-sourced companies are also in the game. Film studios use AI technologies to bring visually extravagant fantasies to the screen. All invest heavily in exploring AI applications that are critical to their futures, according to a Stanford report. Speech recognition, natural language processing and computer-based vision are advancements in AI that are driving innovation. AI is naturalizing the way people interact with technology. Many people, to some level, are accustomed to swiping and talking to their devices. As AI systems improve, our interactions with machines grow ever more nuanced—but without the need for lengthy setup. AI applications can already monitor individuals’ health and alert them to risks, help manage medications and deliver services. In fact, the real value of AI is that it learns to work with us by becoming seamless and customized to individual personalities and goals. Are you investing in AI? Adoption of AI in everyday operational use has led to significant financial growth in the industry’s market revenue. 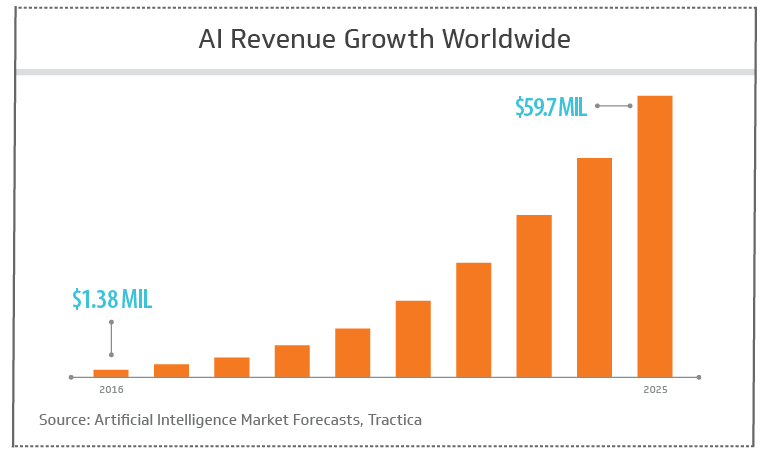 AI revenue is projected to increase by 1,369% in the next seven years. Virtual assistants are software applications that respond to natural language commands or questions. Whether the query is written or spoken, the AI software attempts to carry out the task or provide an answer for the user. Virtual assistants offer time savings and convenience, encouraging further uptake of AI software solutions. 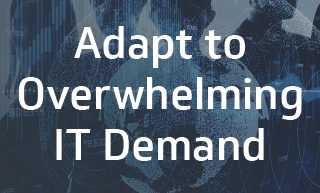 The rising number of connected online devices that make up the Internet of Things (IoT) is one of today’s trending topics, especially when related to digitalization and disruption of traditional industries. These devices, smartphones, tablets and more, which house the WiFi sensors that transmit data, are what we collectively call the IoT. Every added device grants more data availability that can be collected with the use of smart algorithms and machine learning tools, according to Statista. Connected devices such as laptops, tablets and mobile phones are linking up everywhere to make our lives easier. With new functionalities being addressed by IoT gadgets, the number of connected devices is expected to grow 226% over the next seven years. The IoT is expected to improve quality of life—businesses are gaining insight, expanding services and reducing operating costs. 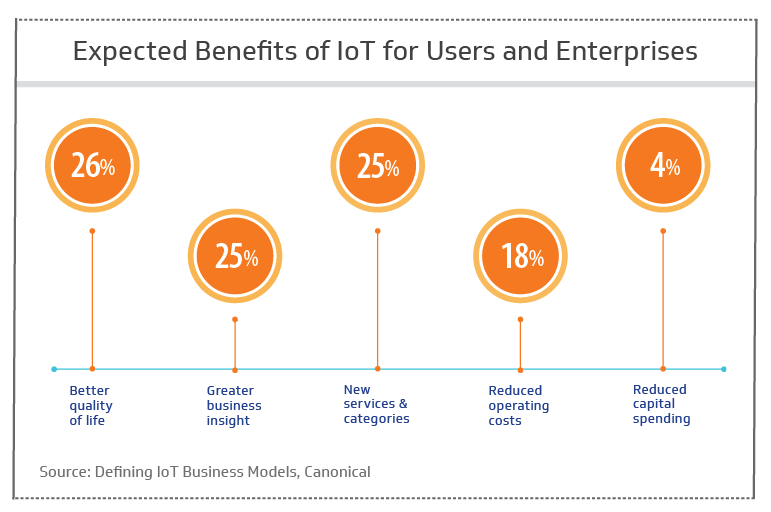 Are you gaining an advantage through IoT? The IoT, in the context of private homes, is referred to as a Smart Home. Opportunities for automation in the domestic space are almost countless—the U.S. was the leading smart home market in 2017, with revenues of $15.4 billion. A blockchain is a data structure consisting of virtual “blocks” that make it possible to create a digital ledger of transactions and share it among a distributed network of computers. It uses cryptography to allow each participant on the network to securely update the ledger without the need for a central authority. Currently, the technology is primarily used to verify transactions within digital currencies. However, it is possible to digitize, code and insert practically any document or service into a blockchain. Doing so creates a record that cannot be changed; furthermore, the record’s authenticity can be verified by the entire community instead of a single centralized authority. The first blockchain is the underlying technology that supports the virtual currency called Bitcoin. The start of Bitcoin dates to November 2008, when a thesis was posted on the Internet by Nakamoto Satoshi called “Bitcoin: A peer-to-peer electronic cash system.” While the first blockchain’s focus was on supporting Bitcoin and its cryptocurrency, by July of 2014 a monumental shift in blockchain technology occurred with the advent of a new blockchain called Ethereum. Ethereum introduced the concept of utility to blockchains through the creation of tokens, decentralized applications and smart contracts. Ethereum ushered in a new era in blockchains. A modern blockchain not only enables digital currencies, but also houses documents, personal identities, applications, databases and supercomputing abilities. -Blockchain is referred to as an “immutable ledger” as it stores all transactions for eternity and it cannot be tampered with. -It allows untrusted parties to exchange financial and smart contract transactions in a peer-to-peer (P2P) fashion. -Blockchain also rewards participants for processing transactions through Proof of Stake (PoS) or Proof of Work mechanisms (PoW). The rewards are in the form of cryptocurrency coins or utility tokens—both of which can be bought and sold on the various cryptocurrency exchanges in return for fiat currency (USD, EUR, YEN, etc.) or traded for other coins such as Bitcoin. 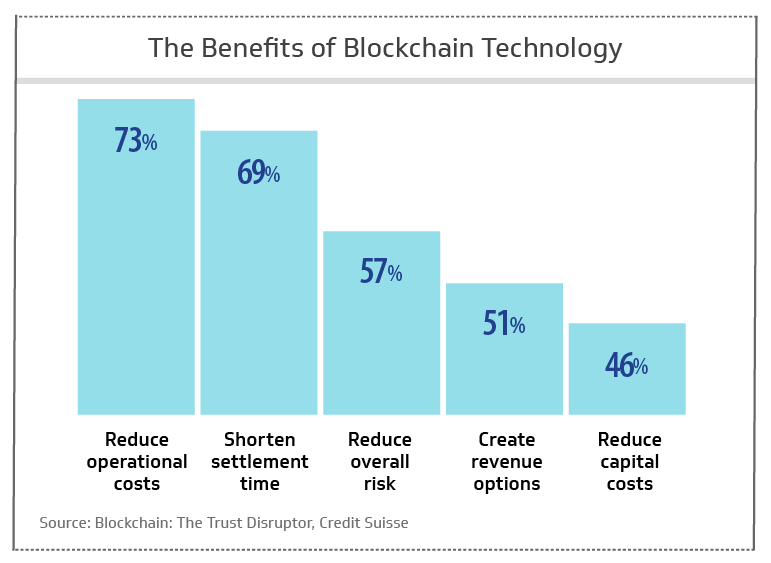 Blockchain technology offers organizations around the world the benefit of reduced risk, cost savings and revenue opportunities. Bitcoin’s first offering in January 2009 was the first and only decentralized cryptocurrency, giving rise to a craze of currency mining and new transactional based virtual wallets. Early adopters became Bitcoin billionaires. The second cryptocurrency, Namecoin, emerged more than two years later in April 2011. Today, hundreds of cryptocurrencies with variable market values are saturating the market, according to a 2017 global cryptocurrency benchmarking study. Many Initial Coin Offerings (ICOs) have come, and some have gone. Those that remain are actively traded; in fact, thousands of cryptocurrency transactions are supported by online platforms. Cryptocurrency adoption is on the rise. 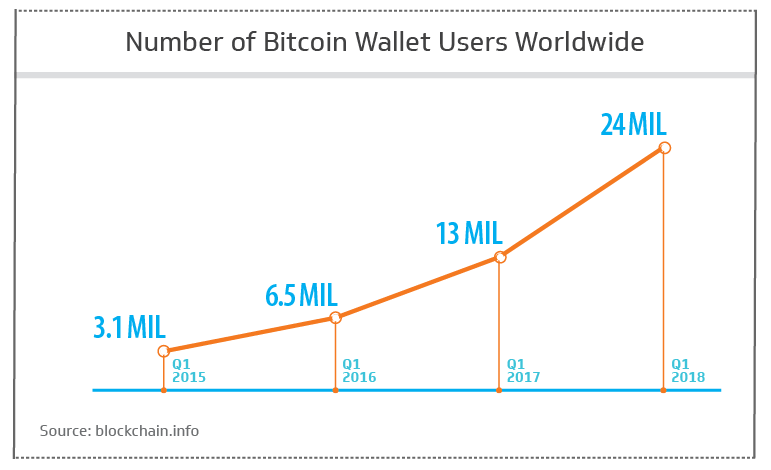 The number of blockchain backed online wallet users grew 674% between Q1 2015 and Q1 2018. Initiatives defined as data analytics have become increasingly prevalent for enterprises over the past decade. This is partly because the term is used broadly to refer to all aspects of the evolving technology. As a top priority for chief information officers (CIOs) over the past 10 years, the primary goal of data analytics is examining aggregated data to turn it into useful information. As computing power increases and advancements in technology, like machine learning, continue to evolve, analytics will focus more on predicting and prescribing actions based on analytical output. Organizations have progressively developed ways to capture and interpret data around business operations. This large-scale type of information aggregation resulted in databases, data lakes and data warehouses. These big data sets hold the potential to provide leaders with detailed information for decision making. Early data analytics allowed companies to make decisions based on what the data implied (Descriptive Analytics). As more information becomes available, such as data gathered from web experiences, loyalty programs, etc., computing abilities will advance to provide a picture of what occurred and what will happen (Diagnostic and Predictive Analytics). Ultimately, when data analysis is integrated with machine learning, analytics can be pushed even further to predict what should be done to achieve a desired result (Prescriptive Analytics). Big data refers to data sets that are too large or too complex for old-school data processing applications. The term big data is used interchangeably when referring to varied methods of extracting value from data. Companies now routinely depend on large-scale storage of raw data, quantitative processing power and the application of algorithms. Note that not every piece of data earns a place in the big data index. The challenge of big data is discovering the useful data amongst the deluge. Big data collection has evolved as firms more actively consider how data analytics can be used to innovate and compete. It has expanded into almost every organizational pursuit, becoming the basis of development in the implementation of AI and machine learning, according to NewVantage. 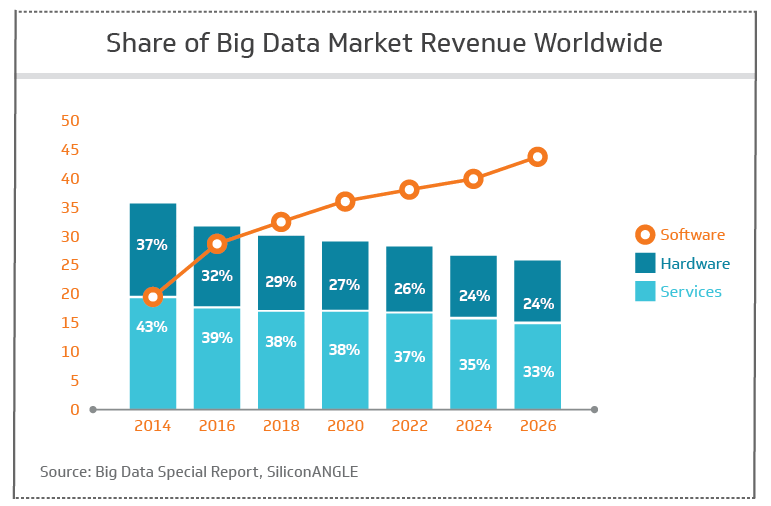 Big data revenue is expected to shift from a majority share in services to a higher segment of revenue from software, creating a greater demand for skilled talent in this growing area. What’s your spending strategy to capitalize on big data? Data is dependably used to predict and suggest items that online consumers might be interested in purchasing, based on browsing history and other behavioral patterns. On e-commerce sites, retailers routinely include modules that offer additional items for purchase, based on the shopper’s history and the history of others that share a similar data profile. Consumers often act when options based on personal data anticipate their needs. Similarly, while communicating with others on social networks or browsing e-commerce sites, consumers are increasingly engaged by brands offering personalized experiences through even more channels, per the 2017 Future of Retail report. Augmented reality (AR) assimilates digital information and the physical environment in real time. AR simulates real-life environments with super-imposed images or animations, according to Statista. It relies on a motion capture camera from a mobile device or special headgear. The user experiences sensory enhancing sound, images, haptic feedback and even smell as if in the natural world. Virtual reality (VR) requires the use of enabling hardware and software to replicate or create an environment based on reality or the imagination of the creator, according to Statista. The goal of VR is to create a sensory experience for the user, including sight, touch, hearing, smell or even taste. VR is sometimes called “immersive multimedia,” as well as “virtual environment” or “computer-simulated life”. 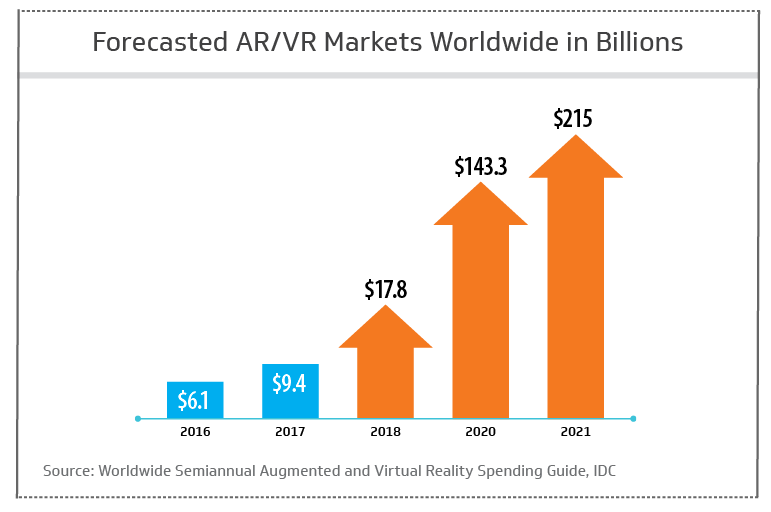 Worldwide AR/VR markets nearly tripled in the past two years and are expected to grow by 1,108% in the next three years. Virtual realities proliferate in digital gaming, art platforms, virtual tourism and online education. Augmented reality technology reached worldwide recognition after the launch of the popular mobile game Pokémon GO, one of the world’s leading gaming applications. Cybersecurity is the practice of regulating access to information, per Statista. This includes identity verification or providing a framework of protection from unauthorized access. Information security at the consumer level is usually limited to the use of passwords, anti-virus software and firewalls to protect personal computers and other electronic devices from harmful intrusive theft. Enterprise information security, in comparison, is complex and can cover one or more networks inclusive of all servers, related electronic systems, routers and communications equipment. Enterprise cybersecurity software, hardware and information management policies all work in tandem to secure corporate data. New markets shape enterprise security innovation. Vast repositories arise from initiatives based on big data and the Internet of Things (IoT). As a result, organizations have shifted toward managed info security services, aligning skills and equipment against evolving threats. Cybersecurity encompasses some of the fastest growing jobs in the U.S. Suspected causes of security incidents appear to be from a range of sources and indicate a need to address cybersecurity on both internal and external fronts. Information security challenges impact many facets of our lives both professionally and personally. Quality security professionals and partnerships are integral for organizations to securely provide business enabling technologies and services. Most of us know someone who has been personally impacted by identify theft, credit card fraud or falling prey to phishing emails. These infringements will only continue to increase until the barrier to enter the electronic criminal market exceeds the benefit of the investment and risk of being discovered and apprehended. It is important that organizations and individuals continue to partner and assist one another in preventing, detecting and responding to cybersecurity threats. The collective good is forming more impactful partnerships and forums, positioning organizations to successfully navigate the turbulent waters of cybersecurity. 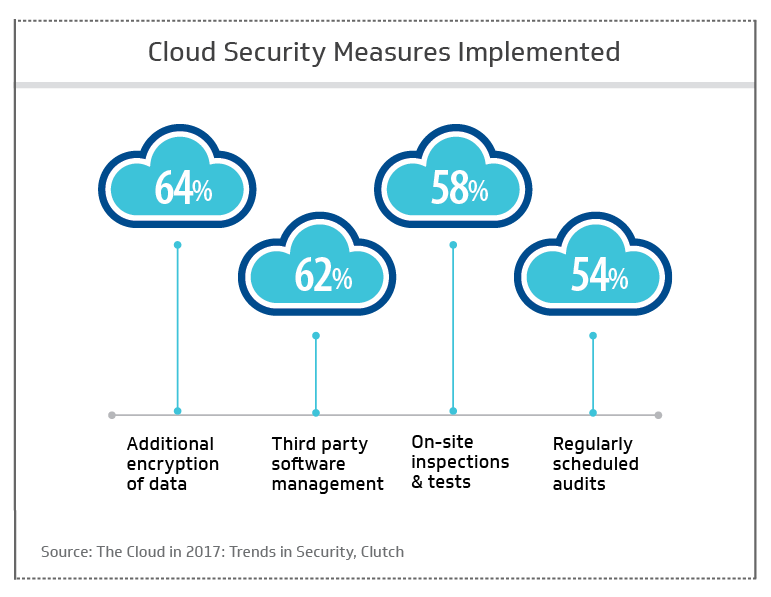 Cloud storage and services integrate several types of security measures including encryption, software and audits. 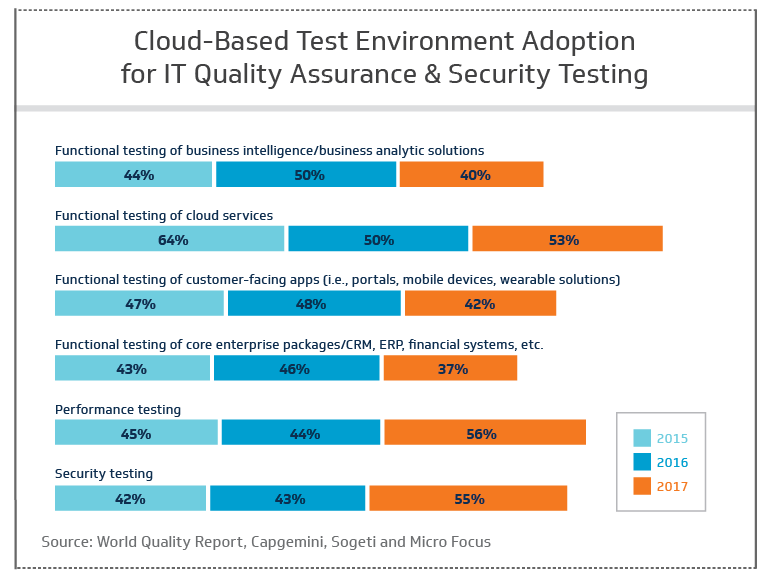 Organizations use cloud-based testing tools to assess the effectiveness of their security, services, analytics and enterprise-wide systems. A 2016 Javelin research study reports that identity fraud has resulted in $112 billion stolen directly from individuals storing data with enterprises—that’s $35,600 stolen every minute. This is a never-ending issue. As new online services become accessible and more efficient, an unknown number of vulnerabilities may be unintentionally created. With the recent trend of data breaches, now more than ever, organizations need innovative methods to validate identities. The result is a paradigm shift away from passwords as a necessary progression to secure both the organization and their customers’ identities, according to an IBM security study. Alternatives that replace traditional passwords are seeing increasing recognition and adoption. The most popular are biometric authentication options like fingerprint, voice or facial recognition and keystroke dynamics.